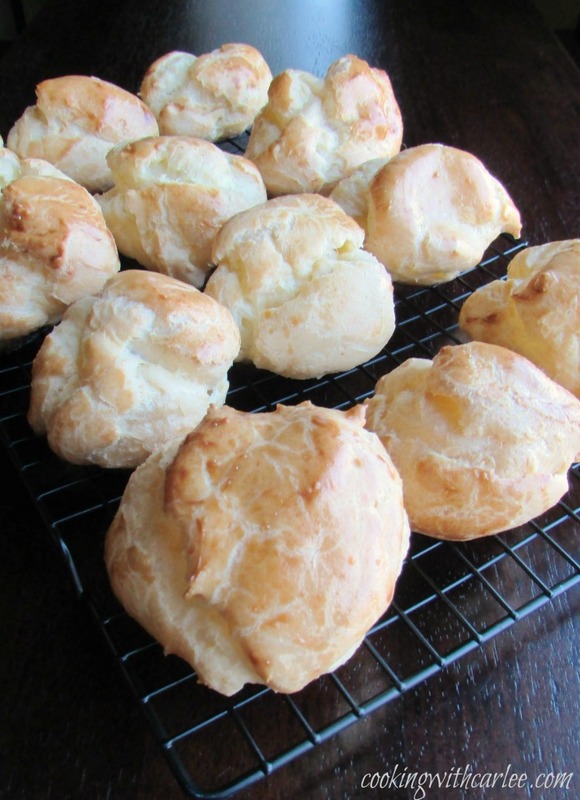 Cream puffs are easier to make than you might think. These slightly oversized pastry shells are filled with a pumpkin cheesecake cream for a perfect dessert! Make easy choux pastry into delicious fluffy shells and fill them with pumpkin cheesecake filling. It is easier than you think and oh so good! Cream puffs have been on my mind for a while now. They have come up in various conversations and I just knew I needed to make a batch sooner rather than later. The problem is what to fill them with? There are so many options; delicious sweet filling, beautiful savory fillings. I mean the possibilities go on forever! Plus they seem like they should be made for an event of some sort, not just because it's cloudy and I feel like it. Then there is pumpkin cheesecake. Ever since I found my new favorite way to make a no-bake cheesecake filling, I have been dying to make a pumpkin version. The issue was whether or not it could hold all of the liquid of the pumpkin puree. I had only ever added more solid stir-ins. That's when it hit me! The batch of pumpkin butter would be perfect! I would add some of the necessary sweetness and some of the excess moisture had already been cooked out. And you know what would be an even better shell than lady fingers? Cream puffs! Voila! Just like that a plan was born! I love it when a good plan comes together. Don't you? So all I needed after that was an event to make them for. There are plenty of things coming up on the calendar, but they all seemed so far away. But with #PumpkinWeek around the corner, that was all the impetus I needed to just go for it. 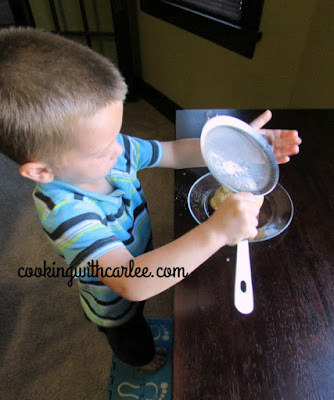 Of course my little helper wanted to get in on some powdered sugar action! It was so much fun to serve these puppies. MiMi and Pops came over for dinner and I whipped these out. As I was taking pictures they were guessing what the filling was made of. They couldn't decide from the color if it was caramel, peanut butter or pumpkin. Of course it was pumpkin... though don't those other flavors sound wonderful too? 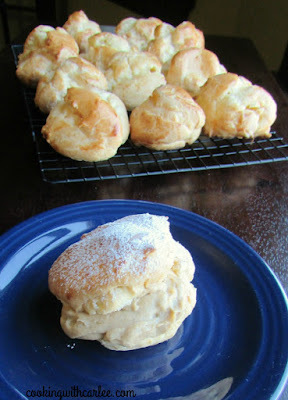 Now I need to make a bunch more cream puffs! Preheat oven to 400 F and grease to baking sheets. Bring water, butter and salt to a boil in a large saucepan. Add the full cup of flour at once and stir until a smooth ball forms. Remove from heat and let cool for 5 minutes. Add eggs, one at a time, beating well after each addition. Beat until the mixture is smooth and shiny. Scoop large dollops (about 3 T each) of dough onto prepared pans. Whisk together milk and egg yolk. Brush dough with egg yolk wash.
Bake for 30-35 minutes or until puffed and golden. Remove to wire racks and immediately cut a sit for steam to escape. Let cool completely. To make filling, beat cream cheese until smooth. Add brown sugar, vanilla and pumpkin butter and beat until completely incorporated. With the mixer running on medium, drizzle in cream until completely incorporated. Turn mixer to high and beat until light and fluffy. 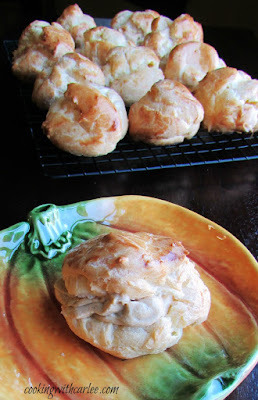 Pipe or spoon into cream puffs just before serving or store in refrigerator until ready to use. Dust filled shells with powdered sugar then serve. I always thought cream puffs were hard to make. Yours turned out so beautifully. I will definitely make them soon. Yum! They're really easy and kind of fun! Thanks! Brilliant idea to fill them with pumpkin cheesecake. MMMM! Funny...cream puffs have been on my mind too. I just talked about them with my daughter recently...and I've seen other photos of them. A favorite! Thanks so much for sharing with us at Weekend Potluck. Isn't it funny how things kind of cycle around? I probably haven't had a cream puff in a couple of years and then out of the blue I can't get them out of my mind! I am glad I got to scratch the itch, I hope you do too! 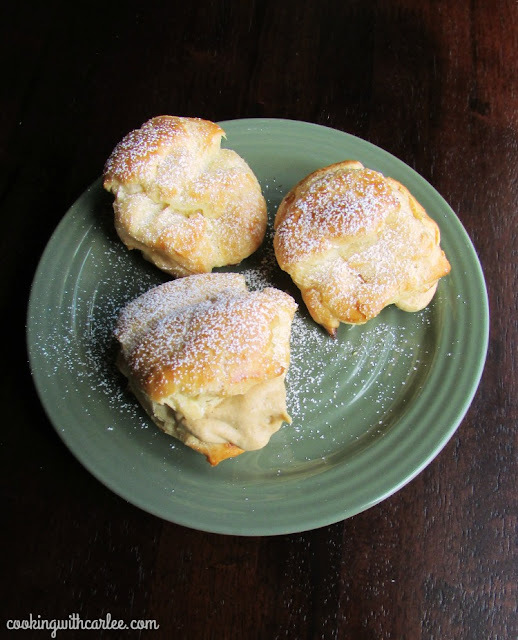 My mom used to whip up cream puffs. I hadn't thought to make them in a while. You make it look so simple I must try. Love the pumpkin filling. I love the flavors of fall! Thanks for sharing. Thanks, Linda! I love cream puffs and eclairs. I feel like they look a lot more complicated than they really are too, which makes them that much more fun to serve! Great recipe Carlee. I'll bet they were scrumptious and I love your plates. Thanks, Wendy! They were delicious and so much fun to make. Thank you! They were so much fun to make and easier than you'd think! I have never thought of making these before, but now I have to! Thanks for sharing at Merry Monday! They are so much fun to make! I hope you give them a try. Thank you! I love cream puffs and pumpkin cheesecake sounds so yummy. A fun dessert for dinner party. You are on top of the pumpkin recipes this year Carlee! This one looks so yummy and decadent! I haven't had a cream puff since I was a kid, what's wrong with me?? I must get on that ASAP! These look absolutely amazing! 😍 I love the addition of pumpkin! Carly, can I come live with you? Pretty please? I won't take up much room, promise! And one more mouth won't be that much, right? You have the best ideas with food! Pumpkin butter filling? In a cream puff? Girl, I am now starving, I wasn't before I read this! This is right up my alley! So creative. Just regular old all-purpose flour will do it! All-purpose. There isn't any leavener needed.